1 : 1250000 Mitchell, Samuel Augustus Jr.
1 : 1190000 Tenney, R.A. Political map of Illinois. 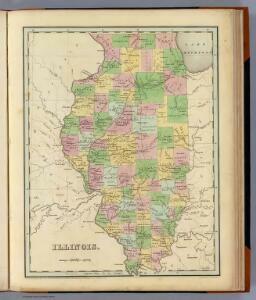 Worthens geological and climate map of Illinois. Official railroad map of Illinois. 1 : 2100000 Campbell, R.A.
1 : 1520640 Johnson, A.J. 1 : 1750000 Colton, G.W. 1 : 2027520 Tanner, Henry S.
1 : 1700000 Goodrich, S.G.
1 : 1700000 Bradford, Thomas G.
1 : 2154240 Lucas, Fielding Jr.
1 : 2154240 Lea, I. 1 : 1387000 Hammond, C.S.